''Stories seep into your cells and become part of you until sometime later you realise you know that story, and tell it again. ''Continuing the wonderful journey to the Folk Tales of Britain and Ireland, I found myself in beautiful County Clare. Here, I came across all those characteristic elements that give this special aura to the Irish myths and legends.We meet brave women like Maire Ruad who refused to submit herself to men and conventions. Healers like Biddy Early, beautiful maidens and princess like Grian, the daughter of the Sun, and evil queens and witches like Mal and Mong Finn. We meet heroes like Cúchulainn and Brian Boru, mythical blacksmiths from the times of the Tuatha Dé Danann. Mermaids, fairies, ghosts and elves, saints and monsters, and naturally, magical water horses. (We are in Ireland, after all! )My favourite stories were the Little Ark of Kilbaha -which if it is true, it must have created quite a blast- and The Woman Who Was Knitting. The last one reminded me of grandmother who used to say that noone should talk to a woman while she was knitting, because all the good wishes that were being woven with every movement of the needles would be disturbed. I suspect the real reason is quite a bit more practical, but anyway...Ruth Marshall writes as if she's narrating each story to every reader, in a personal and quirky language and provides the sources of many tales, along with a handy pronunciation guide.So, this one is highly entertaining and highly recommended. Next stop, Wicklow, the Garden of Ireland, and one of my most favourite places in the world. 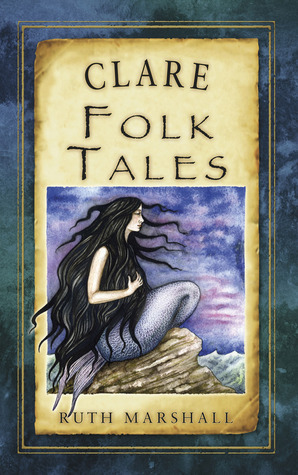 A nice, varied little collection containing a mix of fairy tales, heroic stories, country yarns, and tales of saints and monsters. I enjoyed it. There's a fair bit on Biddy Early and the stories of the Gaban Saor, which I particularly remember from school. I do like the clever tales, though some of the cleverness becomes more obscure with time. I was fascinate by Maire Ruad and tickled by the idea of the ferocious fairy badger. As I've come to notice, it's the Christian stories that often end up being the more hair raising - their hagiographies rival the stories of Cuchulainn in heaping praise as well as holiness on the holy men. St Senan humbles the proud, lays low the powerful and kicks monsters in the bum by sheer dint of his utter awesomeness, then bans women from his island completely. Good man, Senan. Ruth Marshall - Ruth Marshall is a poet, storyteller, author living in rural East Clare in the west of Ireland.Most of what I do involves some kind of creativity, healing and personal transformation - whether that is as a writer, storyteller, life coach, healer, facilitator or crafter.